Sadguru Shree Aniruddha has said this many a time, the journey of every person on the Bhaktimarg (path of devotion), each step of his on this path is put forth only as per the guidance of Lord Hanumanta. Shree Hanumanta himself holds every Shraddhavan by the finger and walks him or her through the Bhaktimarg – thus, the bhakti of Lord Hanumanta proves to be essential. Shree Hanumanta, among the Panchguru (Five Gurus) of Shree Aniruddha, is His Rakshakguru (The Guru who protects). (Hanumanta, the mighty rids all the diseases and miseries of those, who remember him). The best way of doing devotion or even stepping onto the path of bhakti by holding His finger is by performing the Ashwattha Maruti Poojan. The month of Shravan(Hindu calendar month) is considered very auspicious for performing ‘Vrat(devotional resolve) and Pooja(worship)’ in the Indian Vedic culture. The Shree Ashwattha Maruti Poojan is thus performed in the month of Shravan which is a reverent submission to Hanumant, who makes the journey of a devotee on the Bhakti marg possible. It is indeed a blessing that we get to revere the ‘Ashwattha’ tree while praying to Shree Hanumant, who holds the position of a Guru. The reason behind this resides in the significance of the tree. Ashwattha is none other than the Peepal (Sacred Fig) Tree. This tree holds extraordinary importance in the Indian scriptures. ‘Roots in the upward direction and branches in the downward direction’ is how the Ashwattha tree, symbolising worldly life. The Ashwattha tree is thus, believed to represent the relationship between the ‘Paramatma’ and the world (where the roots denote the direction of the Paramatma, while the whole world is laid out under its protection). Bhagwan Shree Krishna, while describing himself in the Bhagwat Geeta (sacred Hindu epic scripture) as – ‘Among all the trees I am the Ashwattha’, has indirectly underlined the importance of the tree. The Ashwattha tree is thus worshipped for this very reason. Sadguru Shree Aniruddha Bapu initiated the ‘Ashwattha Maruti Poojan’ in the year 1997, with the beautiful intent that every Shraddhavan should be aware of the importance and auspiciousness of ‘Shree Hanumant’ and the ‘Ashwattha tree’. Sadguru Shree Aniruddha Bapu carved from a homogenous rock the only unique idol of Hanumant, which is the centrepiece of the celebration of the poojan. 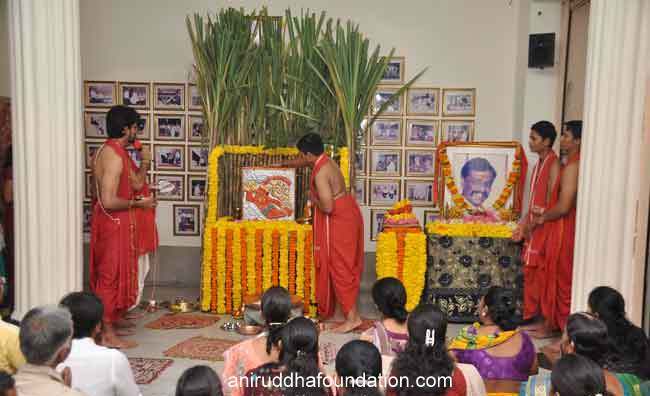 Every year, in the month of Shravan, the pooja is conducted at ‘Shreekshetra Sadguru Nivas-Gurukul, Juinagar’ on every Saturday. However, on the last Saturday of Shravan, this event of ‘Ashwattha Maruti Poojan’ is held at ‘Shree Aniruddha Gurukshetram, Khar’. The ‘Ashwattha Maruti Poojan’ is conducted sequentially, starting with the preparatory poojan arrangement, the central ceremonial rites then followed by the darshan. Behind the stone sculpture of Hanumant carved by Shree Aniruddha, a branch of the Peepal tree (the Ashwattha tree) is placed as a symbol. A fine metallic idol of Hanumant is placed in a copper salver before the sculpture. 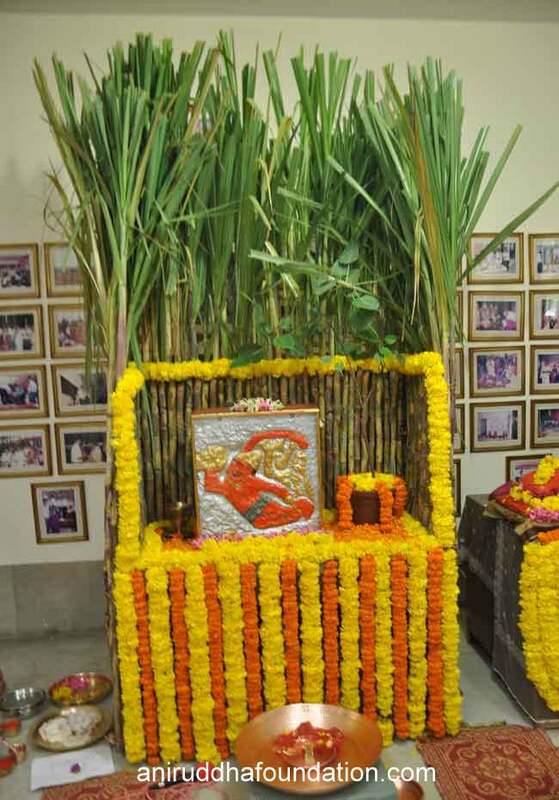 At the backdrop is placed an overlay of sugarcanes against the arrangement and decorations. A group of Prapathaks (religious reciters) is tasked with a continuous, uninterrupted recital. At first, the Ashwattha (Peepal) branch is worshipped in the Vedic manner, by chanting the mantras of ‘Om Ashwatthaaya Namah | Om Urdhvamukhaaya Namah | Om Vanaspataye Namah |. It is then ‘followed by the offering of Naivaidya (consecrated food). The idol of Hanumant is then worshipped by performing the Shodasha Upchara Poojan (16-step rituals for worship). At the time, the ‘Panchamukha Hanumat Kavach’, ‘Sankat Mochan Hanuman Stotra’, and ‘Om Shree Ramdutaay Hanumantaay Mahapranaay Mahabalaay Namo Namah |’ are chanted 54 times. Five Shraddhavan bachelors are asked to offer the ‘shendoor’ (saffron coloured powder) and ‘lahya’ (popped rice grain), while an abhishek (anointment with water) is performed on the idol of Lord Hanumant, resting on the copper plate by a pre-designated couple. Simultaneously, another abhishek is also performed on the idol of Shree Panchamukh Hanumant. The facility to perform a symbolic abhishek on a beetle nut is also available for the Shraddhavans who so desire. Every Shraddhavan gets an opportunity to apply the shendoor to the Hanuman idol while taking its darshan. The pooja ceremony draws to a close with the poornaahuti (final offering) and a final recitation of the ‘Bhimarupi Maharudra’ stotra. Anjani Mata is Shree Hanumant’s mother, and as a symbol of her presence, the Dhuni Mata is constructed and worshipped before the idol of Shree Hanumant. The dhuni(sacred fire) ignited in honour of Dhuni Mata, is offered lahya, camphor and samidha (twigs of wood used as a sacred offering in rituals). The Dhuni Mata is also offered turmeric powder and kunku (red vermilion powder) as a part of the Oti (ritual for Hindu women). The Dhuni Mata is laid to rest later, at night. The Pooja celebration then concludes with the recital of the Ramraksha, Hanuman Chalisa and Aniruddha Chalisa. Shree Hanumant is the embodiment of the exquisite union of the forms of Paramatma’s Mahapran on one hand, and that of being the supreme-most devotee of Lord Ramchandra on the other, all at the same time. The ‘Ashwattha Maruti Poojan’ is known as an auspicious poojan of Shree Hanumant and the benefits derived from such a festival are significant and initiate fundamental changes in one’s life. This pooja enables the flow of energy and intellect, to mend the mistakes made in one’s life from its source – Hanumant. When you participate in the ‘Shree Ashwattha Maruti Poojan’, which illuminates the way to expel the sins and adversities from life, it weakens the grip of anger and fear on one’s life. The impact of the Sadesati (a period of seven and a half years believed to be the most difficult in life) of Shani(God) that occurs in every person’s life, is lessened and the harmful effects on account of the planets (believed to influence turn of events in life) in a person’s life are abated. Shree Tulsidas outlined the might of Hanuman as cited in the Hanuman Chalisa – ‘Janam janam ke dukh bisarawai |’ (One who rids of all the miseries of this life and even the past births). ‘Shree Ashwattha Maruti Poojan’ is in itself a golden opportunity available in the holy month of Shravan, to intensify one’s faith towards Shree Hanumant. You can make the payment to the organisation, either by using Online Net Banking or by using Credit / Debit cards. Copyright © 2019 SHREE ANIRUDDHA UPASANA FOUNDATION. Developed by AureaTech Solutions.